All images on this page are protected by copyright. Please see notice below for information about their use. 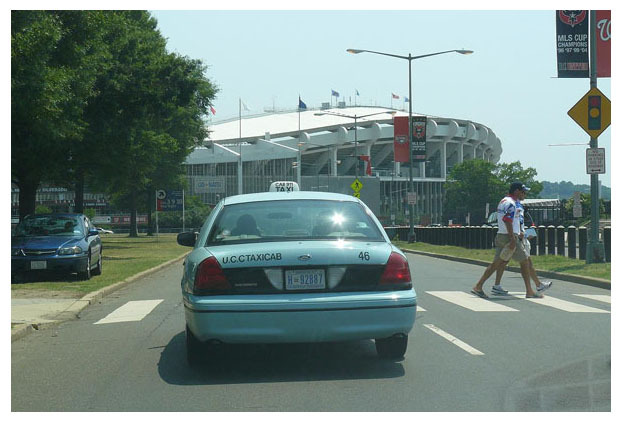 RFK Stadium, home of the Washington Nationals, is situated on the banks of the Anacostia River at the end of East Capitol St., the dividing line between NE and SE quadrants of the city. 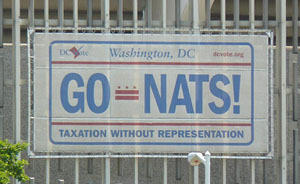 The plate-theme banner, sponsored by DCVote, is displayed on the side of the stadium just above the roofline of the taxi. 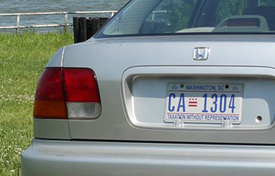 A close-up image of a recently-issued taxi plate similar to no. H-92887 may be seen by clicking here. 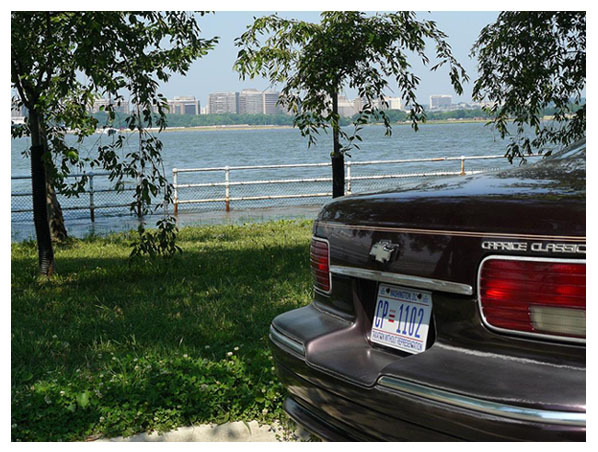 Displayed on the Chevrolet parked on the grass is a D.C. Fleet plate of the style shown here. 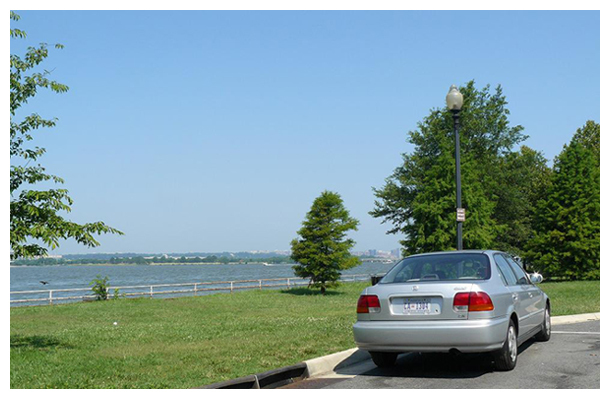 Hains Point, at the southern tip of East Potomac Park in the Potomac River, provides scenic views of the river and Rosslyn, Virginia. The sight of autos with D.C. plates is common, of course, in Washington's residential and business districts. Around the monuments and federal buildings downtown, however, it's amazing how few D.C. vehicles are seen - they are far outnumbered by cars and trucks from Maryland, Virginia, and the other 48 states, as well as those belonging to the U.S. government and to foreign governments that use Dept. of State plates. Most D.C.-plated vehicles seen downtown, especially during the busy summer tourist season, are tour buses. 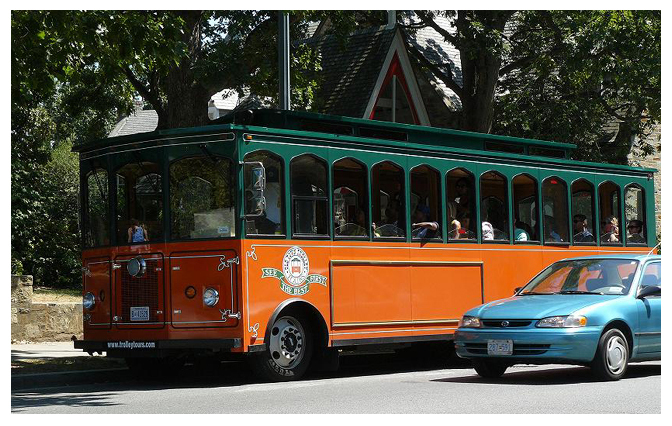 Here, one fashioned to appear like an old trolley is overtaken by a vehicle registered with Capital City plates. 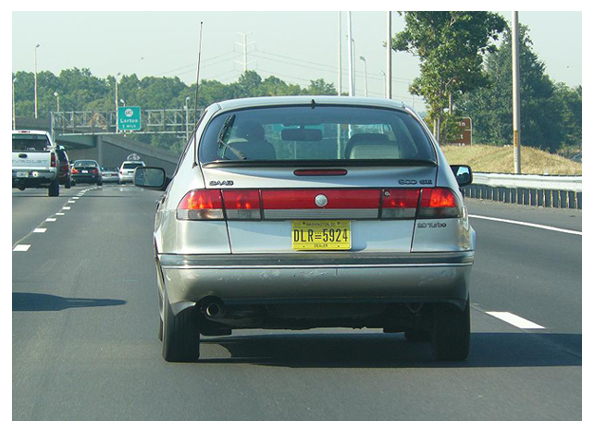 Special license plates issued to vehicle dealers are replaced annually, at the end of October, and are made in a color scheme different enough from regular plates to be noticeable while in use. As discussed on our dealer plate page (link), registration numbers are assigned sequentially and begin on each new annual plate where numbers on the previous year's plate ended, hence the number far higher than would be expected based simply on the relatively small number of vehicle dealers within the District. The dealer to which registration no. 5924 was assigned was operating a Saab on I-95 southbound near Lorton, Va., when this photo was taken, not long before the yellow exp. 10/31/07 plates were retired. Lorton is about 20 miles southwest of Washington.